The Vikings remain undefeated in league play and hope to earn state playoff spot. Following two straight wins to open the new Pacific Conference's season, the Forest Grove Vikings girls' soccer team battled Liberty to a draw last Wednesday, Oct. 17, playing the Falcons to a 0-0 tie at Forest Grove High School. The Vikings had a handful of opportunities in both the first and second halves of the game, missing on a couple close attempts near the net. "We should've won that game," said Forest Grove head coach Nacho Olvera. "It was a very, very competitive game, and they had their chances, but our chances were right there in front of the goal and we just couldn't put one away." One chance in particular appeared to many to cross the line before a Liberty defender — seemingly out of nowhere — stopped the ball and sent it the other way, denying the game's first goal and, ultimately, a Vikings win. Asked after the game whether he thought it was a goal, Olvera stood behind the referee's decision, citing the official's angle opposed to his on the sidelines. "The referee has a better view than we do, so I asked him, and he said he was ready to call it a goal, but out of nowhere, a girl came in and kicked it out," said the coach. "He said it was right on the line, and I let these refs do their job, so I wasn't going to argue it." With the tie, Forest Grove improved their conference record to 2-0-1 and currently sit in third place behind undefeated Glencoe and Sherwood. While not entirely surprising — after all, the Viks have talent and are playing in the wake of one of the program's most successful seasons in recent times, one in which they advanced to the second round of the OSAA state playoffs — it has been a bit eye-opening due to a winless non-league slate that ended with Forest Grove 0-7-1 prior to its first league game with Newberg. "Our preseason was pretty tough, but now that we've got a couple wins, everybody has started to play again," said Olvera. "Early on, the score wasn't indicative of how we were playing. We just struggled to put the ball in the net, and when you don't get the wins, the pressure mounts." The coach said it's that pressure, coupled with some of the Vikings' youth and inexperience, that has led to poor decisionmaking when presented with scoring opportunities. He said that rather than thinking and acting calmly in those pressure moments, the girl were "panicking," which led to a lack of the type of quality shots necessary to get wins against good — or even mediocre — teams. "We've had our chances, but our decisionmaking hasn't been what it's needed to be," the coach said. "We're panicking in front of the goal. We're taking too quick of shots, or we're just making the wrong decision regarding whether or not to take an extra touch or kicking it one time." 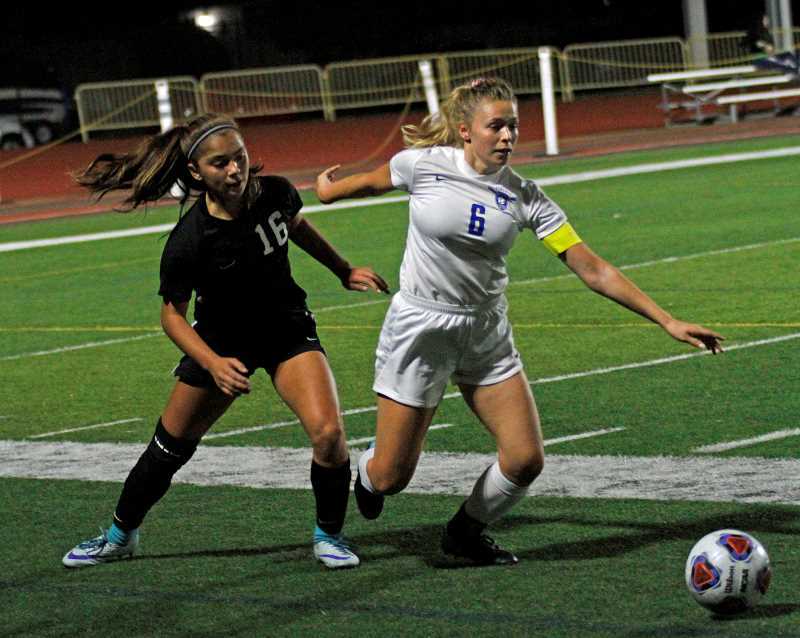 Some of the pressure has come from nervousness of some of the younger and more inexperienced girls, but some, the coach said, has simply been the result of expectations based off of last year's success. "Looking back to a year ago, everything went well, and I think that pressure to repeat it got to the girls," said Olvera. Now, with a couple wins under their belt, the coach said he's seen the difference in the Vikings' play on the field. He hopes that newfound confidence will lead to a couple more wins and a shot at the state playoffs. "The pressure has started to come off," Olvera said. "The other thing is we're starting to trust each other, and that's invaluable. The girls just didn't want to release the ball, but now we're coming together. We'll take it one at a time over these last three games, and if the girls can continue to play this way, we have a shot to make the playoffs." Forest Grove was scheduled to play at Sherwood Tuesday, Oct. 16, after this paper's print deadline, and will host McMinnville Thursday, Oct. 18, before closing out the regular season at Glencoe next Monday, Oct. 22.